EDIT: Erin has since left Club Pilates for a move to California and we are so sad but wish her well. The good news is Club Pilates has other great instructors ! And they will have so many more after their teacher training later this Spring! The main thing is that my posture is improving with every workout. Pilates is an absolute killer workout for your abs/core, and having a stronger core is improving my back. I would often get lower back pain because my muscles were so underused and so weak but as I strengthen them, my back pain is a thing of the past. I am also noticing my thighs (inner and outer) and bum have better tone and definition. I am loving the appearance of more sculpted legs and just cannot wait to see more progress. My flexibility has increased 100 percent. 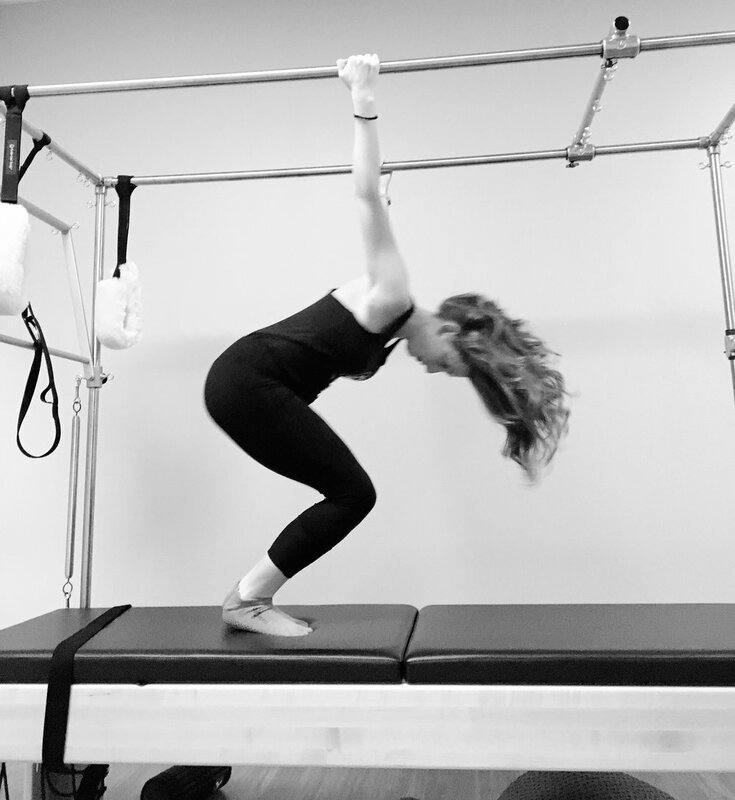 I have the most coordination and balance too.The reformer is an amazing piece of equipment, and part of that is how fun it is! I learn something new everyday. I get the resistance training I need and enjoy greatly (love training like an athlete) but also get to feel some length and grace I never get in indoor cycling. I get to be tough and strong and graceful and long all at once. Who on earth wouldn't want that?! I especially love the cardio based Pilates classes at Club Pilates. We utilize the Jump-board and I love adding these to my weekly routine. The Jump-board is an attachment that converts a reformer into a horizontal jumping machine. 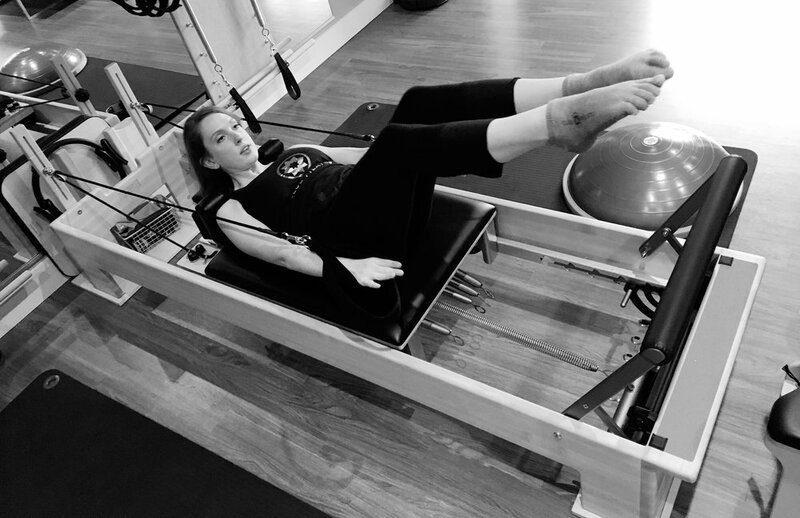 It fixes to the front of the reformer where the foot-bar is. While lying with your back on the carriage you can adjust the spring tension and jump on the board as if it were the floor. The spring tension takes gravity out of the equation, so it feels like you’re jumping on the moon. I feel like I am flying and I get such a great workout. I love that I can get a full body workout at Club Pilates. There is such a wide variety of classes allowing you to mix it up and get everything you need for your body type. I also love that I have learned how to use my own body weight for resistance, with the option to add equipment in such as a theroband to increase the intensity. I am leaving town today actually for two weeks and did not want to take a break from my Pilates training. So I bought a few therobands to bring along and some 5 pound hand-weights and I plan on doing a 30-45 minute workout daily in my hotel room. 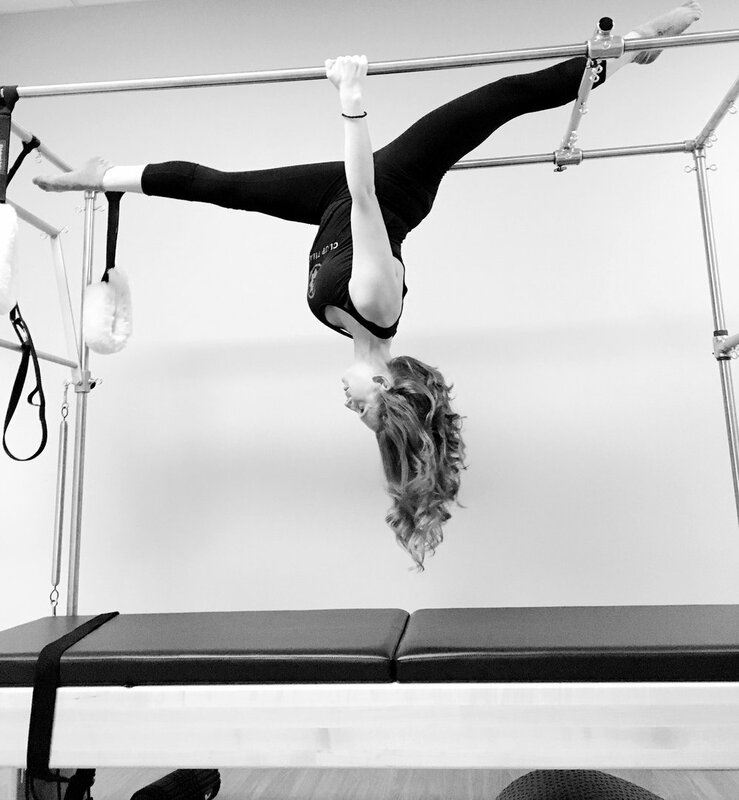 I have learned so much from one of my pilates instructors at Club Pilates--Erin DeCoursey. 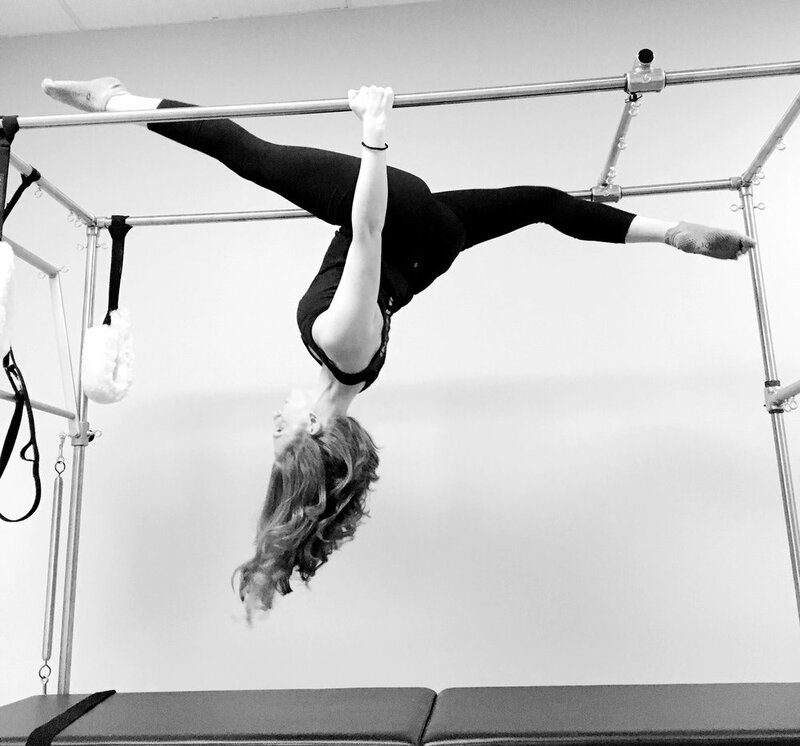 Read on to get a taste of Erin's passion and dedication for Pilates, along with what makes her proud as a Pilates instructor! Her classes are always so fun and challenging. And she definitely pushes me hard. Just try one of her CP Fit classes if you are looking for the ultimate "burn baby burn". It's so good! -How did you get into Pilates? I first got into pilates when I was studying dance in college. -Tell me about your time as a ballerina?! I just went to college for dance but by the end of school, I could just feel my body breaking down and new it couldn’t survive a career. -Why do you love Pilates? I love the mind-body connection, so many times people zone out during their workouts but with pilates, if you are more present in what you’re doing not only are you going to get a better workout but hopefully you will take that into your everyday life. -Why did you become an instructor? An instructor of mine was the one who encouraged me to go to the teacher training, she thought it might be a good option for me to look into, to fit in in-between my auditions. (did I mention I’m an actress as well?) I agreed and the rest is history. -How long have you been an instructor? -What makes your class special? I love adding exercises in to my classes that make people think . -Any fave songs that you prefer playing during a class? Right now I love Woman by Kesha. -Why do you love teaching at Club Pilates? I love all the pieces of equipment that I can incorporate into my classes. -Do you prefer technical or fitness classes? I think they both have their purposes, and so everyone should have a balance of both. -What are some great exercises someone can do when traveling in their own hotel room so they don’t have to skip out on getting a good pilate style workout in? A good plank is one of my favorite things to do when I am traveling because when done correctly it is a total body workout. And don’t forget the side planks. -Favorite exercise on the reformer? Supine Arm Work because you can add so much to the exercise if you want something harder or make it simple if you are feeling tired. -Your CP Fit class..what can someone can expect here? To move, we are constantly moving during that class. We use the reformer but we also use hand weights plus our own body weight. Hideaway Pizza, Cimarron with Red pepper flakes and ranch on top. Anywhere really. I studied abroad my last semester of college, so Paris will always be special to me. New York City was the first place I traveled to by myself, so its like going home when I go back, but there are also some amazing places right here in Oklahoma as well. Reading, I still dance every once in awhile and exercising; I love taking a new workout class. -A few of your fave restaurants in Tulsa? -What’s in your cosmetic bag? Sunscreen, Mascara, and R+F mineral peptides, I don’t wear a lot of makeup. -Favorite movie of all time and why? White Christmas, I love old movies. -Your perfect day off—walk me through the day?! Sleeping in, relaxing mainly and maybe one exercise class for myself. My days usually consist of me having to be social and outgoing leading classes so on my days off I like to hibernate and have alone time. Local loves...come join me at Club Pilates South Tulsa. Here's a link for free class. Here's a list of options they offer! Their most affordable membership option, a 4-Pack Membership is the perfect choice for those new to regular workouts, if Pilates is a supplement to an existing training program, or for clients who want to work out about once per week to build and maintain a solid Pilates foundation. Plan to work out three times per week or more? Our Unlimited Membership is the perfect way to exceed your expectations. With unlimited access to the largest national Pilates network, whether across town or across the country, you can keep your fitness commitments with ease. You don’t want to deal with monthly dues – you just want to work out. Our prepaid Annual Membership is the hassle-free option for total access to all Club Pilates studios without paying monthly dues. Nationwide studio access lets you perfect your craft whenever, wherever. Pilates are just the best and I am so thankful that Club Pilates is in my life!! Special thanks to Curt and Vicki Clark with Club Pilates Tulsa for sponsoring my post and getting me out of my comfort zone. I love pilates and am so thrilled to be apart of the Club Pilates Revolution.